Waking up to the aroma of freshly brewed coffee is perhaps the sweetest feeling on a cold morning. Coffee connoisseurs perhaps want to go the extra mile by buying their own coffee bean blend and grinding them themselves right before brewing a pot of coffee. That said, it takes time and effort to grind beans separately, loading them into a brewing machine and hitting the brew start button. The best grind and brew coffee maker can do all that for you in one shot so you won’t waste a minute in the morning but still have that perfect cup of joe. There are several factors that should guide you in choosing a coffee maker with built in grinder. From strength of coffee made, to ease of cleaning the machine, ease of use, and the ability to determine size of grounds among other factors, you want to pick a machine that makes the whole process easy. For instance, among coffee makers that grind and brew, blade grinders are cheaper but they are noisier and the quality of the brew is poorer. Burr grinders, on the other hand, are superior with high quality grinds and less noise. However, they are more expensive. You may also want to consider the carafe. Does the coffee maker have a thermal or glass carafe? If it’s the latter, do you want a warming plate underneath? Also, consider the simplicity of the control panel; you can only make the best cup of coffee if you can fully understand the coffee maker. You make prefer a separate grinder for complete control from bean to cup and that’s when a separate home coffee grinder is worth it. Coffee makers with grinders built in can sometimes seem complicated and are not for those that rank convenience above everything else. You have pod coffee makers for that! But if freshness trumps everything, read on to see what our picks for the best coffee maker with grinder 2015 are. If you’re the kind of coffee drinker that has to have complete control over the minutest details of the process of coffee making, the new Breville Grind Control coffee maker is the machine for you. It is an updated version of the YouBrew model that many users thought made weak and lukewarm coffee. Because every roast is different from another, the degree of coarseness of the grounds, volume of beans to be ground, temperature of water and speed of brew are all factors that make a big impact on the quality of your brew. With this machine, you get to have complete control over all of them! There are 6 settings to choose from for the conical burr grinder and you can be assured of consistent and even grinding. Depending on the strength setting you choose, the machine first grinds the minimum amount of beans needed, then calibrates the volume of grounds produced from your grind control, then grinds some more and feeds that amount in. You then adjust the other settings and select either the carafe option or single serve. The latter option gives you a choice of settings to accommodate your preference for black, milk, etc., and whether you want to fill a normal sized coffee cup or a travel mug. A Programmable Auto-Start feature ensures you can have coffee as soon as you wake up in the morning and a Brew pause function lets you get your first cup in the middle instead of having to wait until the cycle completes. An LCD display screen shows you all your current settings as well as a countdown timer and level of water left in the tank. This machine comes with a 12 cup stainless steel thermal carafe that keeps the coffee hot for about 3 hours and warm for another 3 without the need for a warming plate. Warming coffee after brewing results in a deterioration of taste so a thermal carafe is good. The bean hopper and filter basket are easily removable for refilling and cleaning and a Gold Tone filter and cleaning brush come included. All the removable parts are dishwasher-safe. Users so far love how precise, quiet and easy to clean this machine is but the calibration for grinding is a trial and error process everytime you change coffee. The Cuisinart DGB-700BC Grind-and-Brew is fully programmable for a span of up to 24 hours and will wake you with a gratifying smell of newly-ground coffee brewing. This model has a burr grinder and a glass carafe complete with a warmer plate that can be programmed to shut off automatically up to 4 hours later. The attractive Cuisinart DGB-700BC is easy to use, as it comes with a measuring scoop, 8-ounce coffee bean hopper and an easy to follow manual book. A sealed grinder lid keeps moisture out. Play around with the cup setting to get the perfect strength of low, medium or high intensity of brew and use the grind control setting to grind just the right amount of beans from 2 to 12 cups. If you already have pre-ground beans, use the grind-off setting and place the coffee in the filter to only brew coffee. If you can’t wait for the machine to completely finish the job, you can pause the dispensing cycle to remove the carafe for a sneaky cup while brewing continues! The machine includes a permanent gold tone filter for the grounds and a charcoal water filter to ensure pure tasting coffee. In addition, it is easy to clean. Note that it requires frequent cleaning of the chute to prevent the grinder from bogging down and it can be a bit noisy. Although the coffee maker scores very high points in performance, it lacks adjustable settings for size of grounds, meaning that you’re only ever going to get medium grounds. Some users have also complained that it leaks but with proper care including regular cleaning of the filter basket and chute, the leaking should never recur. The Capresso CoffeeTeam GS is an entirely programmable, 6 oz bean, 10-cup machine with an excellent conical burr grinder that can control grind settings from fine to course. It has 5 grind settings which ensure that you get the desired texture of the ground coffee beans, 3 strength settings, and 5 quantity settings ranging from 2 cups to 10. You can set the machine to grind and/or brew whenever you want, plus, the 2 hour auto shut-off ensures coffee remains hot for a while. This machine also has an easy-to-read LCD display which indicates the coffee strength and grind settings you have made and the carafe is made of glass. The included GoldTone filter or a size 4 paper filter can be used. The charcoal water filter ensures pure water is used for best tasting coffee. The Capresso 464.05 coffee maker can also accommodate pre-ground coffee, as well as decaf or flavored coffee. All you need to do is select the brew mode instead of grind/brew mode. A Stop-and-serve feature lets you quickly sneak in a cup before the brewing cycle completes. If you like to change up your coffee beans every now and then and change the settings to suit the new bean, you can override the automatic settings that you previously set and manually program the machine at any time. It comes with a 1 year warranty and has exceptional performance levels. Even though this burr grinder coffee maker is easy to use, it has some cons. Some users complain that it is loud and takes long to grind although the coffee quality is always consistent. Moreover, it has no way to unload unused coffee beans if you want to use a different type, so you have to take it apart to do that. A few beans from a previous grind still remains in the chute, so if you change beans the next time, you’ll still get a few old beans mixed in. If you live alone or are the only coffee drinker in the family and only have 1 or 2 cups of coffee at a time, a single cup brewer and grinder may be all you need. It takes up very little space on the counter and you don’t waste beans. Added to that is the lower cost of the machine. The Hamilton Beach Grind and Brew Single Serve gives you one or two cups of coffee at a time or you can fill up a 16oz travel mug instead. An adjustable cup rest facilitates this. It is also very simple to use if you don’t need to have control over the whole process. The strength of the coffee will depend on the amount of grounds you add to the included filter basket or on the amount of beans you add to the hopper. You have the option of using pre-ground coffee directly but you can also choose to freshly grind your beans in the blade grinder just before the brew cycle. Grinding chambers often become clogged because of buildup from the oils. This is a non-issue with this Hamilton Beach model because it features an automatic rinse of the chamber. This grind and brew single cup machine is great for those who like to have their coffee freshly ground but don’t want to deal with a complex process. The price of just under $100 is also nice and even though you can’t adjust the fineness of the grounds, it does do the job well and you can have great coffee with it. It does come with a few drawbacks, however. The included mesh basket does let a few fine grounds escape and they settle at the bottom of your mug. While this shouldn’t be a deterrent, you can avoid this by using paper filters. Also, since this uses a blade grinder, it is quite noisy. 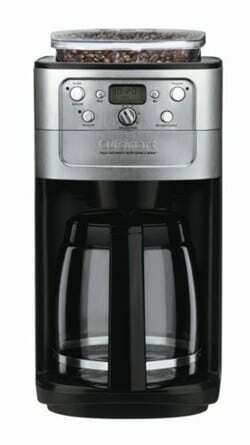 The Black and Decker CM5000B, with a 12-cup capacity and a glass carafe, converts your beans into a pleasing cup of coffee that is as mild or as strong as you need it. With less than $100 you can be waking up to a fresh cup of coffee every morning. Its touch programming panel with LCD display enables you to regulate time setting and strength and the auto brew function is 24-hour programmable makes it possible for you to wake up to newly made coffee every morning. The bronze tone filter eliminates the necessity for paper filters and the integrated grinder works well but can be turned off if you want to use pre-ground coffee. Both are easily removable and simple to clean besides being very easy to use. The coffee maker has a clear-view window that allows you to check the amount of water left in it. Sneak-a-cup, 2 hr auto shut-off and a freshness indicator round off the features. Like any other machine it has its cons. It is quite big and occupies a large space on the counter. A few customers complain about it having too many confusing buttons. However, they all say that all in all, you can’t get a better machine for this price! ← What is the Best Rated Hand Mixer in 2018?